Difficulty: Easy with gentle walk along the ridge. The nagarkot changunarayan hiking is the most popular hiking around Kathmandu. This is a gentle walking along the ridge overlooking the Kathmandu valley with immanent view of Jugal Himal towards north. We will first walk through the charming, self sufficient villages and then through the beautiful woods. This walking gives a good insight into countryside lifestyle of Himalayan foothills. The territory surrounding Kathmandu valley is dwellings of Tamangs. Tamangs are pre Buddhist Tibetan immigrants following shamanism. The walking ends at the oldest documented Hindu pagoda of Changunarayan tagged as World heritage site by UNESCO. Nagarjun hill in the north of Kathmandu is the nearest hiking trail from the tourist center of Thamel. The well preserved Nagarjun forest is part of the youngest and smallest Shivapuri Nagarjun national park. The hiking starts from the fulbari gate at the eastern base of the hill. The well made trail climbs on steps at first and then gradually winds through the thick forest. At the top are Buddhist monastery and a view tower. The hill is named after the 'Siddha Nagarjun' as there are caves and dwellings of him. The hilltop of 1,950 m offers magnificent view of Ganesh Himal and Langtang ranges towards north. We will drive for about 42 km / ½ hrs to Kavre Bhangyang past Dhulikhel and then start walking through pine forest. The trail climbs for about 120 m to the ridge with a village temple of goddess and then gradually passes through village for about 1 and half hours. We will finally meet the dirt road with occasional motorbikes and cars plying on. It will take about 1 more hrs to get to Namo Buddha. Namobuddha is one of the important Buddhist pilgrimage sites. This is where one of the Bodhishattva (Buddha to be) sacrificed himself to feed nourishing tigress. A stupa has been built with his relic. From the 1,750 m hill top, one can see long stretch of the central Himalayas. Walk back to the pickup point after lunch. NOTE: Since we drive to Dhulikhel, this hiking could be planned with overnight stay in Dhulikhel. Dhulikhel is another popular hill staion east of Kathmandu. It is also possible to spend a night in the monastery at Namobuddha or walk further to Balthali village resort. Kathmandu is surrounded by verdant hills overlooking at the Himalayan ranges. These hills still exhibits countryside lifestyle of Nepal and shelters significant species of wildlife. Day hike or short trek around Kathmandu is fantastic idea to prepare yourself for high altitude trek or Tibet trip. 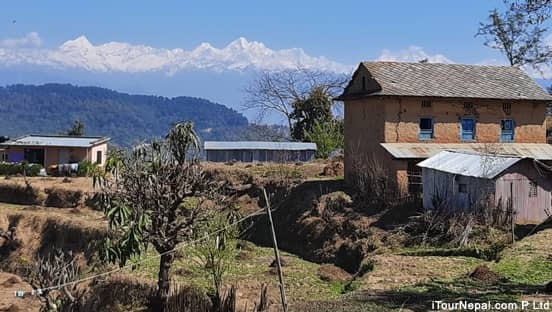 Nagarkot, Dhulikhel, Balthali village resort and Shivapuri village resort are excusive places to stay away from hustle and bustle of Kathmandu. Easy and flexible booking and cancellation. The 1 hr Himalayan sightseeing flight from Kathmandu is the best way to see Mt Everest and eastern Himalayas. Nepal and Tibet tour could be organized from 6 days to month. There are options of flying or overland tour to Lhasa. Lhasa and Everest North base camp could be combined with Nepal tour and trek in one go. The foothills of Himalaya provide beautiful short and easy treks and day hikes starting from either Pokhara or kathmandu.